Brothers living in northern Israel win Defense Ministry tender to supply IDF with fresh eggs. 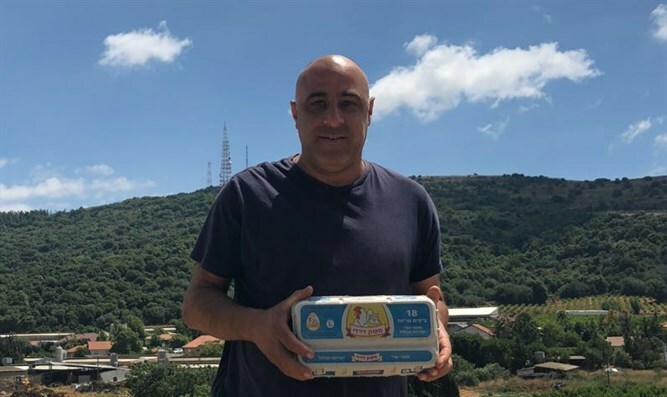 The Defense Ministry's Purchasing Department on Wednesday announced that the brothers Eitan and Liran Davidi won a tender to supply eggs to the IDF. The brothers, who live in the town of Margaliot near the Lebanese border, will supply Israel's ground forces, Navy, and Air Force with 720,000 eggs per week, and approximately 144,000 eggs per day. The Davidi brothers run an egg production and marketing business, and own four coops located in Margaliot. "We were born into a complex security situation on the northern border," they said. "There were days when the north saw difficult times, of war and emergency, and we are 'the children of the shelters of old.' This tender is a significant milestone for us, and we thank the Defense Ministry for the opportunity to work with it, and to market eggs to the IDF." "This shows a significant step forward in the Defense Ministry's willingness to give preference to products from the north, and we offer congratulations on the progress. We are ready to carry out our task perfectly and to supply the IDF's soldiers with fresh, quality eggs straight from our coops in the north." Purchasing Department Head Avi Dadon said, "The Defense Ministry is proud to expand its purchasing activities in areas of national priority and towns on Israel's borders. This is part of the Defense Ministry's policy to aid the periphery and small businesses."